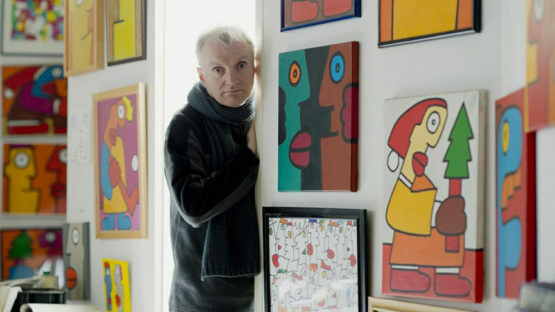 Thierry Noir is the man to whom we owe the longest concrete painting in the world. His paintings, with their bright colors and their melancholy poetry, represent nowadays the art of the Berlin wall. His wall works survived longer than all the others even after the fall of the wall in 1989. Noir had to work quickly to fill the concrete panels so as not to be discovered or chased away by the border patrol while painting.These restrictions determined his style: heads in profile with full lips outlined by simple black lines like in a comic, painted two-dimensionally and in bright colors. One head fit on one or two vertical Wall panels. After a little while, each of Noir’s painted panels got an individualized face. Since this time, Noir’s exploits and highly distinctive visual language have become world famous and immortalised in popular culture such as Wim Wenders’ 1987 film Wings of Desire and the cover of U2’s album Acthung Baby. Noir is today being increasingly recognised as a key forerunner of the modern street art movement and in 2013 worked outdoors in London alongside renowned international street artists of the current generation such as Phlegm and ROA.